Mangokiwi got her socks so now I can spill the beans. By the way her picture is a million times better than this one, and she is modelling the socks so go there and look! 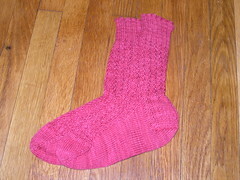 The yarn is Sundara sock yarn in "red red over tomato". Beautiful subtle variegation and just enough twist in the yarn to have the cables and stitches well-defined... one can't have enough of this yarn -- or at least, that's what I tell Boy. The pattern is Nicole's 9 to 5 socks. I like the heel a lot: the cable continues on the sides of the heel and the half linen stitch is much nicer than the regular slip 1, knit 1. I might have misunderstood the instructions on how to show the selvedge stitches on the outside so I'll have to look at this again at a later time. This is a great pattern if you're knitting for someone else because the socks stretch a lot so you don't need to be paranoid about the size.